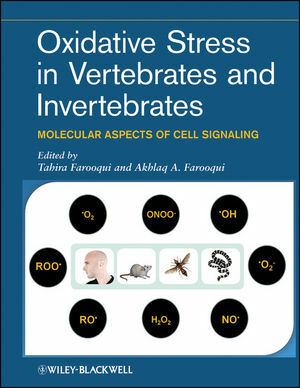 This volume presents a unique comparative treatment of the role oxidative stress plays in vertebrates and invertebrates in multiple organ systems with regards to cell death, development, aging, and human diseases, and anti-oxidant therapy. It offers comprehensive reviews of the current understanding of oxidative stress-mediated physiology and pathology as well as directions for future research. It also provides current information on the role of oxidative stress in neurodegenerative diseases, cardiovascular diseases, and various types of cancer mediated by oxidative stress. TAHIRA FAROOQUI has published extensively on drug receptor interactions, biogenic amines in vertebrate and invertebrate nervous systems, glycerophospholipid and sphingolipid metabolism, and molecular mechanisms in the brain, as well as on the neuromodulatory role of octopamine in the reinforcement pathway involved in olfactory learning and memory. AKHLAQ A. FAROOQUI is a leader in the fields of signal transduction, brain phospholipase A2, bioactive ether lipid metabolism, and polyunsaturated fatty acid metabolism, among others. Farooqui has published on the generation and identification of glycerophospholipid-, sphingolipid-, and cholesterol-derived lipid mediators in kainic acid-mediated neurotoxicity by lipidomics.